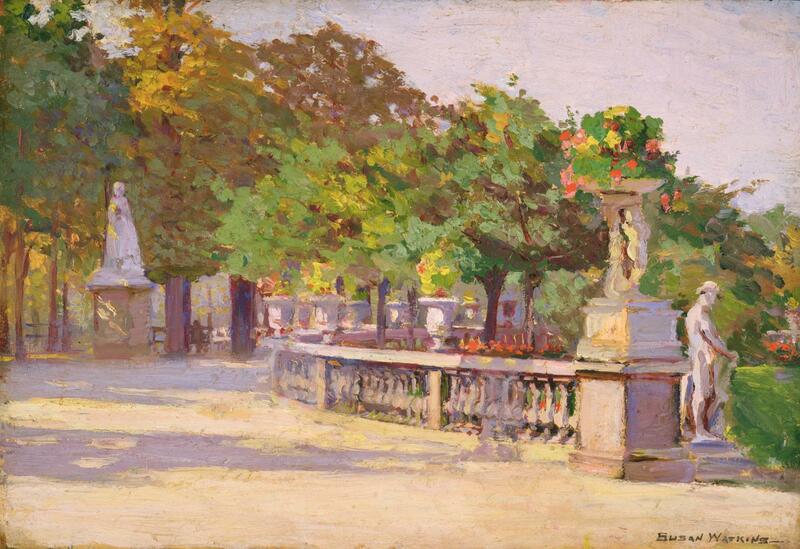 Susan Watkins (1875–1913), View of the Jardin du Luxembourg (1) (c 1908), oil on board, 10.8 x 7.3 cm, Chrysler Museum of Art, Norfolk, VA. The Athenaeum. It’s unusual to come across a successful American painter who doesn’t even merit a stub entry in Wikipedia, but Susan Watkins (1875–1913) had such a tragically brief career that she seems to have been overlooked. 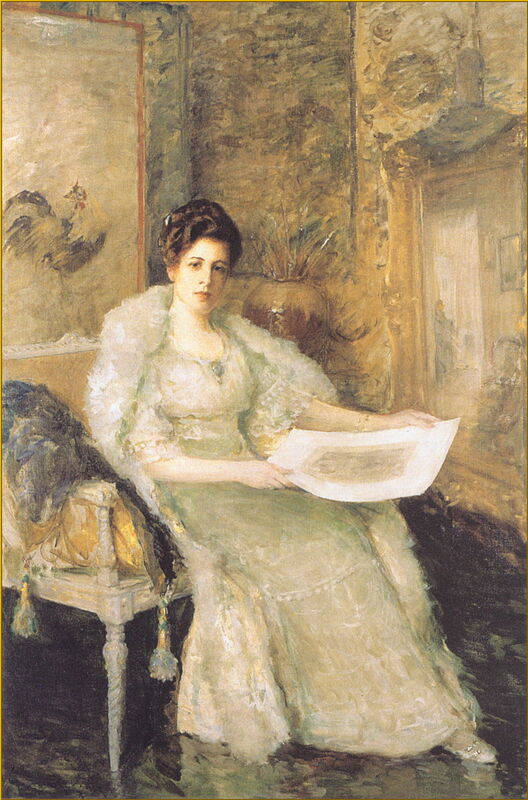 In the decade before the start of the First World War in Europe, she was one of the most successful American painters in Paris, and a friend (and relative by marriage) of William Merritt Chase. William Merritt Chase (1849-1916), Portrait of Susan Watkins (c 1912), oil on canvas, 75 x 52 cm, Chrysler Museum of Art, Norfolk, VA. Wikiart. Chase’s Portrait of Susan Watkins was painted a year after Susan Watkins’ death, in her memory, and only a couple of years before Chase himself was to die. She holds a print, which is an allusion to one of her paintings, The Engravings (1910). On her easel, at the right, is another of her works, Morning Room (1910), and beside her head is a large jar of brushes. Susan Watkins was born in California, but her family moved to New York, where her father was an editor for the New York Sun newspaper. She started her training at the Art Students League in 1890, at the age of only fifteen, where she probably first met William Merritt Chase. Her father died in 1896, so she and her mother moved to Paris, where she resumed her training under Raphaël Collin (1850-1916) in an academic style. She submitted her first works to the Salon in 1899, and continued to exhibit there regularly until she left Paris. She also exhibited her work in American galleries, including the Art Institute of Chicago, and the Corcoran in Washington, DC. 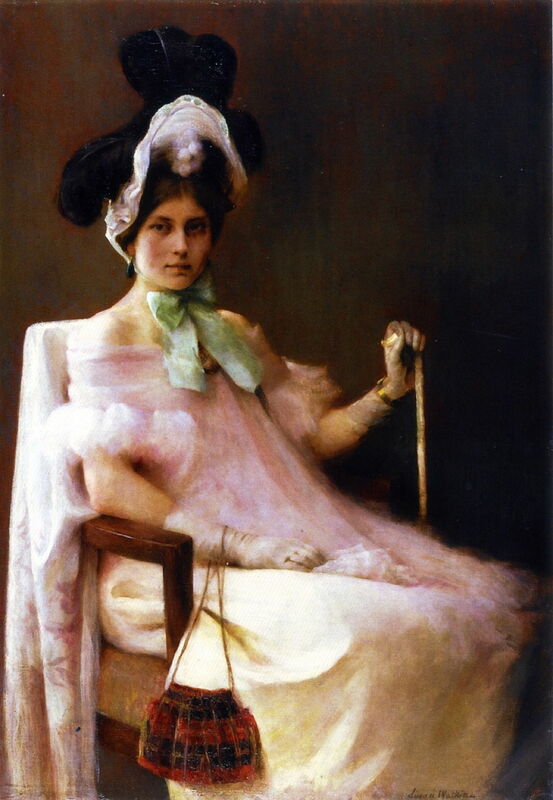 Susan Watkins (1875–1913), The 1830 Girl (Portrait of Miss M.P. 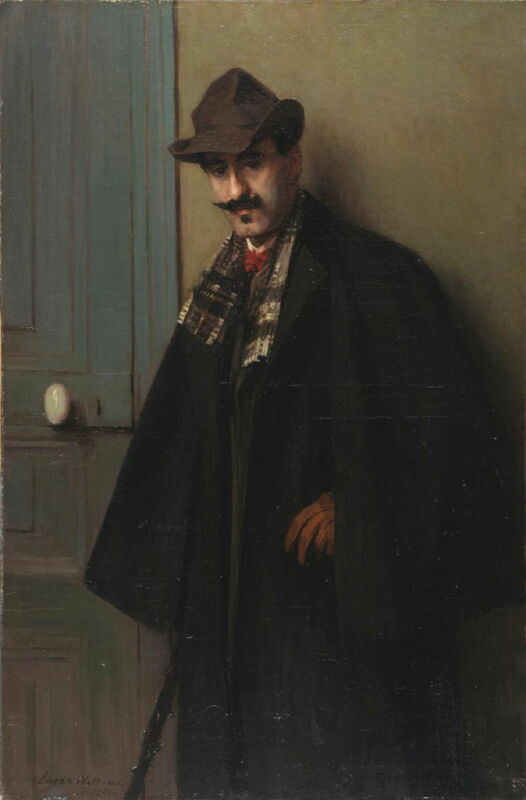 in Louis Philippe Costume) (1900), oil on canvas, 111.8 x 78.1 cm, Chrysler Museum of Art, Norfolk, VA. Wikimedia Commons. The 1830 Girl (Portrait of Miss M.P. in Louis Philippe Costume) (1900). 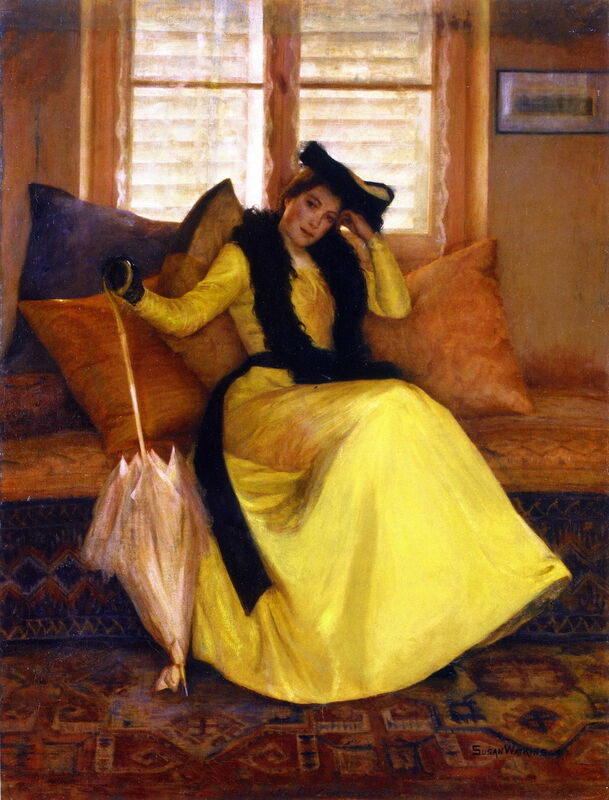 Susan Watkins (1875–1913), Lady in Yellow (1902), oil on canvas, 113 x 90.2 cm, Chrysler Museum of Art, Norfolk, VA. Wikimedia Commons. 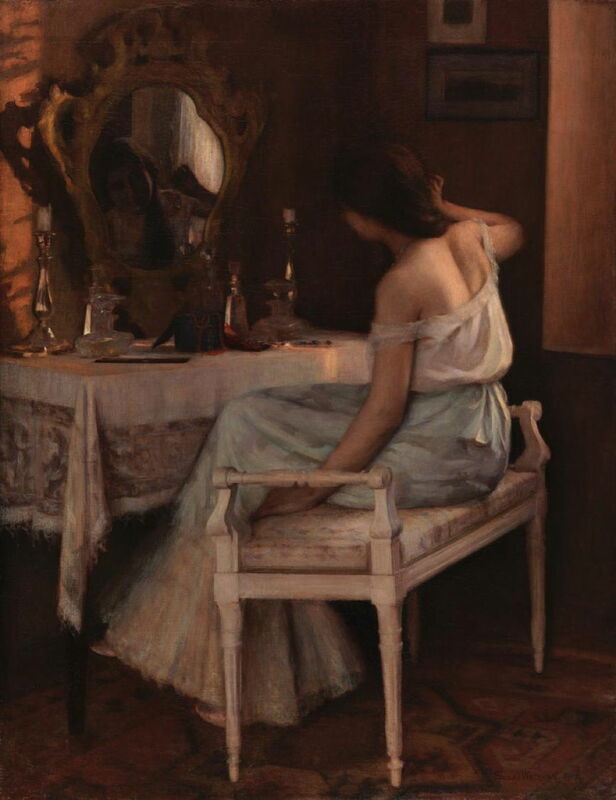 Susan Watkins (1875–1913), The Necklace (1902), oil on canvas, 117.2 x 90.8 cm, Chrysler Museum of Art, Norfolk, VA. The Athenaeum. Susan Watkins (1875–1913), Study 1 for Boys Picking Grapes at Capri (c 1906), oil on canvas, 23.5 x 32.4 cm, Chrysler Museum of Art, Norfolk, VA. Wikimedia Commons. In about 1906, Susan Watkins appears to have visited the island of Capri, in the Bay of Naples. When there, she painted two superb studies for one of her finest works, showing local boys picking grapes on the island. The studies are above and below, and the finished painting with two boys is below that. 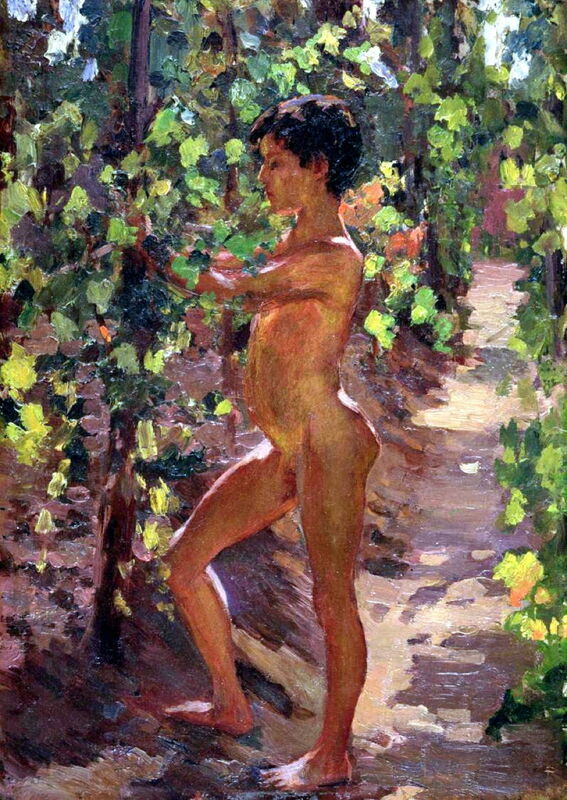 Susan Watkins (1875–1913), Study 2 for Boys Picking Grapes at Capri (c 1906), oil on canvas, 35.6 x 25.7 cm, Chrysler Museum of Art, Norfolk, VA. Wikimedia Commons. Susan Watkins (1875–1913), Boys Picking Grapes at Capri (c 1906), oil on canvas, 79.4 × 52.1 cm, Chrysler Museum of Art, Norfolk, VA. Wikimedia Commons. Her finished painting of Boys Picking Grapes at Capri (c 1906) shows the much looser, more painterly, and richly chromatic style typical of her more mature work. Susan Watkins (1875–1913), Marguerite (c 1906), oil on canvas, 201.9 x 94.8 cm, Chrysler Museum of Art, Norfolk, VA. The Athenaeum. Susan Watkins (1875–1913), Portrait of Alfred Maurer (1908), oil on canvas, 116.8 x 76.2 cm, Chrysler Museum of Art, Norfolk, VA. The Athenaeum. Watkins’ Portrait of Alfred Maurer (1908) is a major work, showing this American modernist painter, who lived from 1868-1932. He too had studied with William Merritt Chase in the 1890s, and went to Paris in 1897, where he seems to have spent much of his time copying in the Louvre. He returned to the US in about 1901, and seems to have gone back to Paris in about 1904. 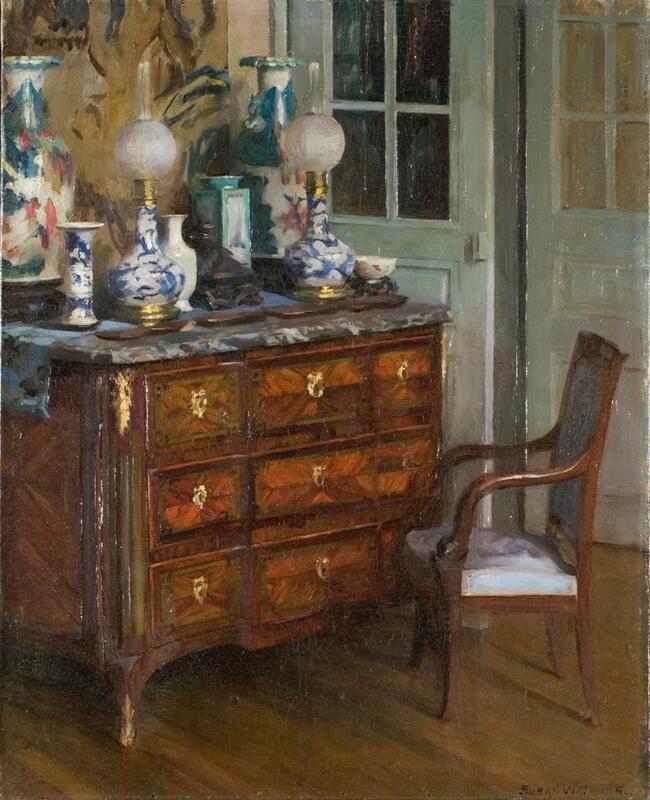 Susan Watkins (1875–1913), French Interior (1908), oil on canvas, 67.3 x 54 cm, Chrysler Museum of Art, Norfolk, VA. The Athenaeum. Watkins also appears to have been an enthusiastic and accomplished landscape painter. All the examples I have been able to find date from 1908, when she seems to have made a series of plein air views of Paris. View of the Jardin du Luxembourg (1) (c 1908). 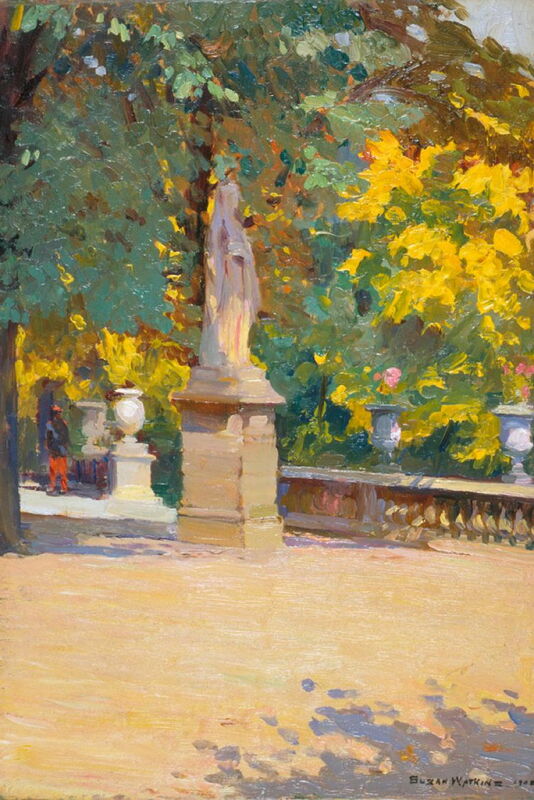 Susan Watkins (1875–1913), View of the Jardin du Luxembourg (2) (1908), oil on board, 18.4 x 27 cm, Chrysler Museum of Art, Norfolk, VA. The Athenaeum. View of the Jardin du Luxembourg (2) (1908). 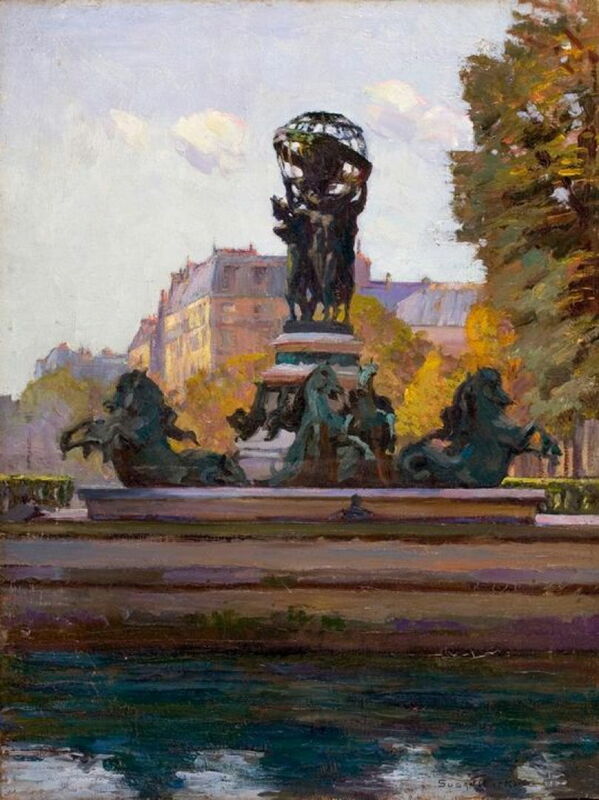 Susan Watkins (1875–1913), View of the Fontaine de l’Observatoire, Jardin du Luxembourg, Paris (1908), oil on board, dimensions not known, Chrysler Museum of Art, Norfolk, VA. The Athenaeum. View of the Fontaine de l’Observatoire, Jardin du Luxembourg, Paris (1908). 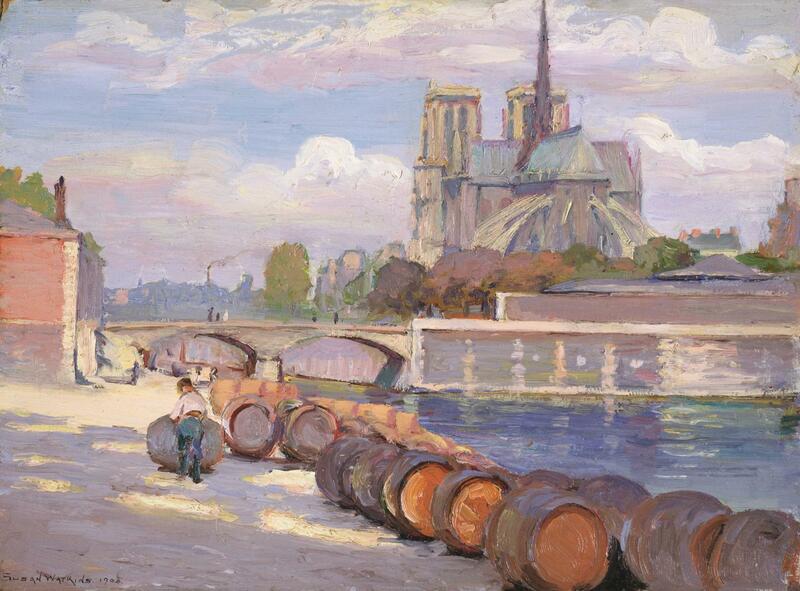 Susan Watkins (1875–1913), View of the Seine and Notre-Dame from the Quai de la Tournelle, Paris (c 1908), oil on paper, 18.4 x 23.8 cm, Chrysler Museum of Art, Norfolk, VA. The Athenaeum. View of the Seine and Notre-Dame from the Quai de la Tournelle, Paris (c 1908). 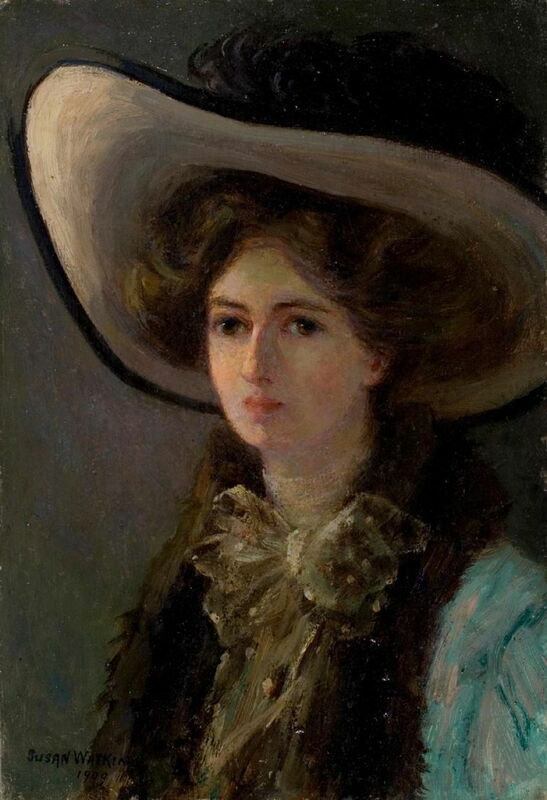 Susan Watkins (1875–1913), Self Portrait (1909), oil on board, 27 x 18.4 cm, Chrysler Museum of Art, Norfolk, VA. The Athenaeum. This is the only Self Portrait (1909) which I have been able to locate, although others may be in private collections. In 1910, Susan Watkins returned to New York, where she continued her career as an acclaimed portraitist, and exhibited Post-Impressionist landscapes and genre scenes. That year she was awarded the Julia A Shaw Memorial Prize, for the best painting or sculpture by an American woman, by the National Academy of Design, in New York. 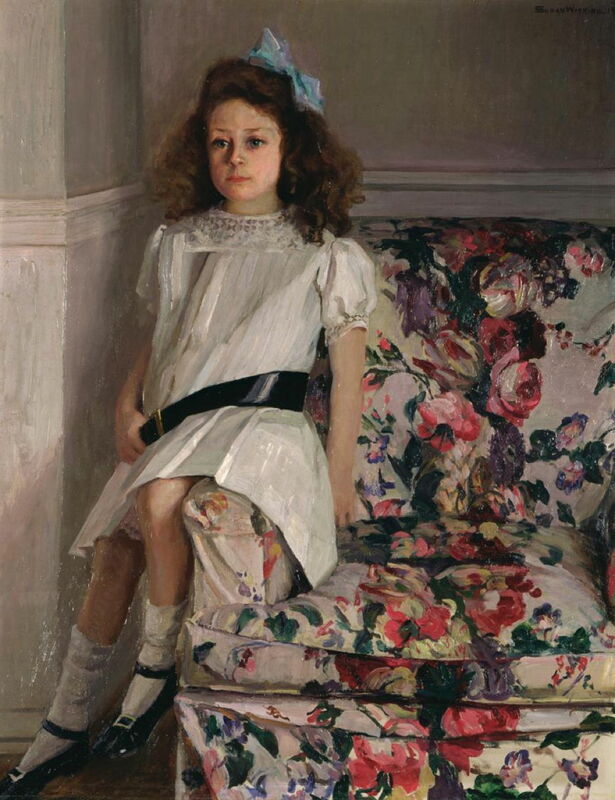 Susan Watkins (1875–1913), A Young Girl (Daughter of Walter S. Martin) (1910), oil on canvas, 113 x 88.9 cm, Chrysler Museum of Art, Norfolk, VA. The Athenaeum. A Young Girl (Daughter of Walter S. Martin) (1910). By 1912, though, she had become unwell, and her health began to fail rapidly. She married the Norfolk banker Goldsborough Serpell, and died in June 1913 at the age of only 37. When her husband died in 1946, he left her paintings to the Chrysler Museum of Art; most, though, remain in private collections. We’ll never know whether Susan Watkins’ paintings would have matured to rank with the likes of Mary Cassatt, but she was certainly well on her way. All the above paintings (including Chase’s portrait of Susan Watkins) are in the collection of the Chrysler Museum of Art, in Norfolk, VA.
Posted in General, Life, Painting and tagged Capri, Chase, landscape, Maurer, painting, Post-impressionism, Watkins, women in art. Bookmark the permalink.